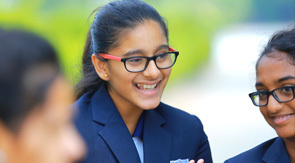 “Amidst an array of distinguished characteristic features that would catapult Manchester International School amongst the best international residential school in the state of Tamilnadu, the atypical experience that students take pleasure in, should remain that of our affordability of a holistic and wholesome academic & extracurricular programme”. The classrooms at Manchester International School thrive with the buoyancy of catering to the innate needs of the students by way of granting ample prospects to put in place their learning and understanding towards real-life circumstances and challenges. Students are taught to ask questions, become skilled to explore possibilities and eventually gain knowledge to investigate answers with sublime confidence. Students study the art of remaining tactical whilst adapting to change and uncertainty that empowers them to diligently operate and remain in command of new technologies, as such. Students ascertain the art of shrewdness and resourcefulness, which empowers them to apply its relevance towards navigating the ensuing complexities of worldly activities. Classroom management: The set of strategies that teachers and students use to ensure a productive, harmonious learning environment to prevent disruptions in the learning process. Classroom orchestration: The processes of structuring classroom interactions and activities in ways that harmonize values of home and school, drawing on students' cultural resources to resolve problems, avoid conflicts, and minimize the need for discipline. Classroom organization: The way that teachers structure classroom interactions and activities to promote learning, including communication, relationships, time, and the arrangement of the physical environment. Classroom Discipline: Any action or set of actions taken by the teacher to directly control student behavior. "My husband and I are extremely pleased with Manchester and couldn’t imagine our children being anywhere else. We have confidence in the school and teachers and our children have reached their full potential in all personal development areas. We are certain that our eldest child will be ready for his senior school of choice when he leaves this year. Manchester played big role in my daughter life that she got placement in the reputed university."